On Wednesday, I introduced Wallis Evera (see Wednesday's post here), an eco-friendly fashion label based out of Vancouver, Canada. 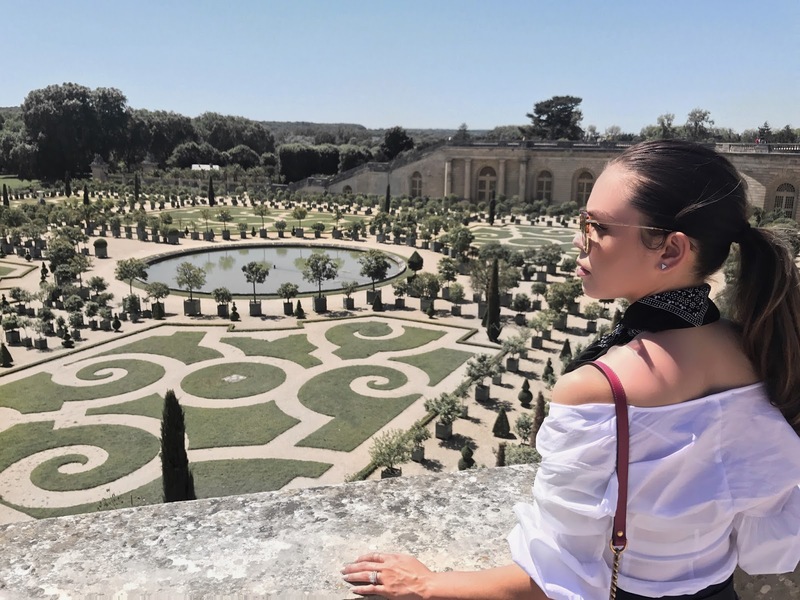 Today, I'm sharing a second look with Wallis Evera from my trip to the Palace of Versailles, along with a few tips on how to inject some Parisian class into your outfits. 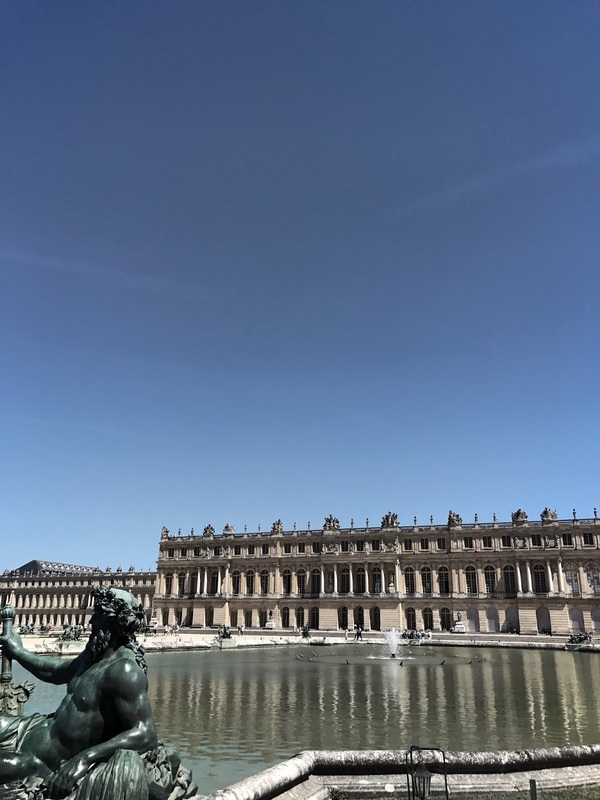 The Palace of Versailles was one of my favourite things the hubby and I did when visiting Paris. We originally planned to only go for 4 hours but ended up staying there the whole day! Surprisingly, it only took us 35 minutes to get there from Paris with our Uber driver. 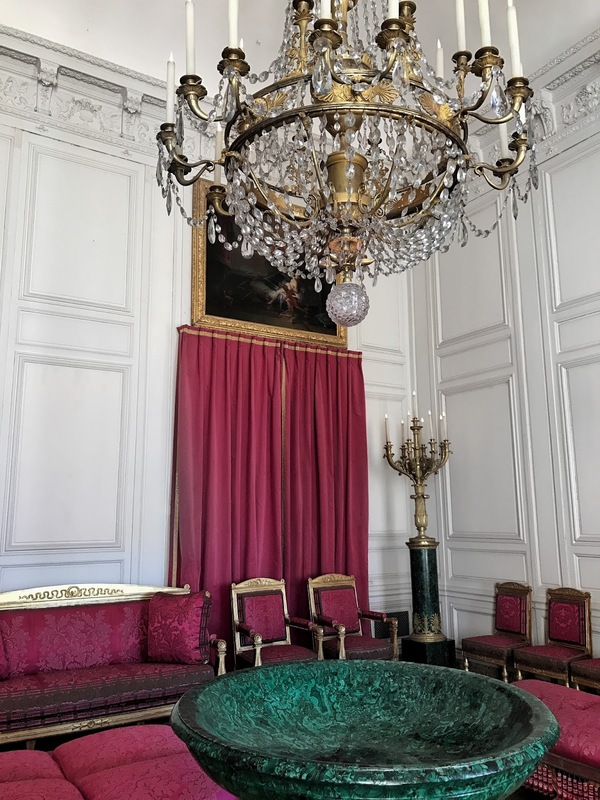 There is so much to see and do at the Palace of Versailles including touring the palace, visiting the many groves and gardens, observing the water show and visiting other residences on the grounds -including Marie Antoinette's home. The gardens and groves were my favourite from our entire day spent there. Next time, I'd pack a picnic lunch to bring with me and sit on the lawn watching the fountains play orchestrated music. I wanted my outfit for my trip to Versailles to feel and look classy and put together, while still being functional. I'll admit that I did switch my mules to sneakers for a good portion of the day to maintain comfort and avoid blisters. Today I'll be sharing a few tips on how to add a Parisian flare to any ensemble. 1. Wear a a dress, skirt or pants with a modest length. French women are classy women and nothing says classy more than a midi length dress, skirt or in my case culottes. I absolutely loved these culottes I styled from Wallis Evera because they had the look of the midi skirt with the ease and comfort of trousers. 2. Sport a polished hairstyle. A sleek ponytail is always a go in my books because it's easy to style and extremely comfortable especially on hot summer days. A high bun or braided hair style are always good alternatives. 3. Keep it neutral. Go for neutral colours like navy blues, whites, blush tones or blacks. Don't be afraid to choose one coloured piece to add some life to your look like the bright pink bag I added to my ensemble. 4. Choose the right heel. A pump or mule is always a classic and safe choice. Just because they're classic, doesn't mean they have to be boring. Try a heel with a red soul, like a Louboutin or color-blocked mules like I wore above. 5. Tie a little bow on it. To complete the look, try adding a neck scarf to your ensemble. 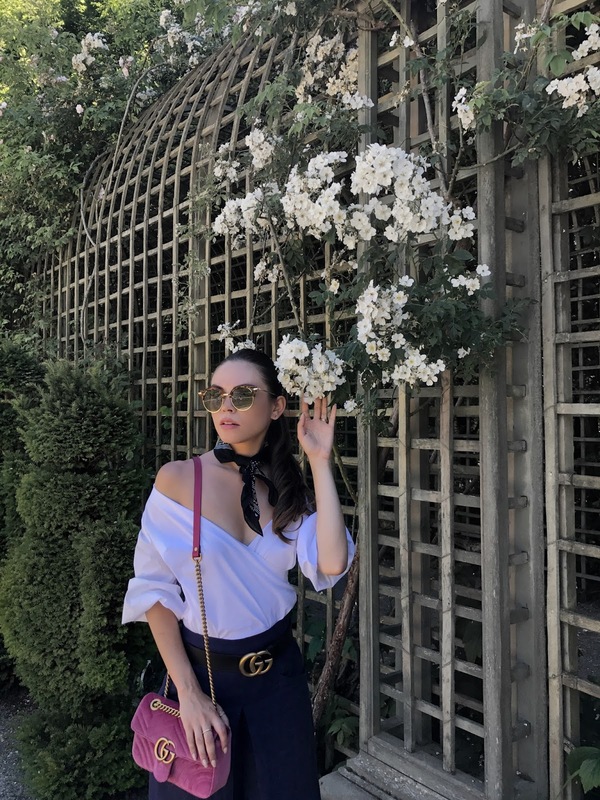 I love styling off-shoulder tops with neck scarf because it keeps the look more modern and current. I definitely hope to return to the Palace of Versailles in the near future. If you're booking an upcoming trip to Paris, I definitely encourage you to make the trip up there - you won't be disappointed! Palace of Versailles looked beautiful! Such a pretty place! And I am loving those culottes. They're definitely chic! Palace of Versailles is so beautiful. I can see how you ended up spending the entire day there. Your wardrobe and styling choice is perfect. You look stunning and your pics are gorgeous. Excellent advice and a very beautiful outfit! I love this Palace and the gardens are wonderful! You are so on point, your Gucci accessories are amazing! In love with this looks! This is EXACTLY parisian chic! What a fab outfit! 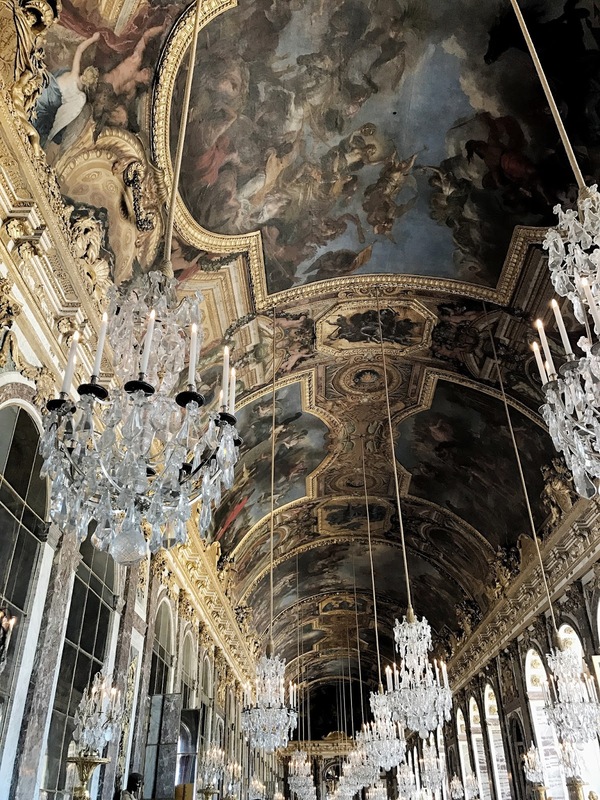 Parisian chic is right - and the architecture of the Versailles Palace is beyond stunning! These photos are beautiful and you look gorgeous! I love this look! 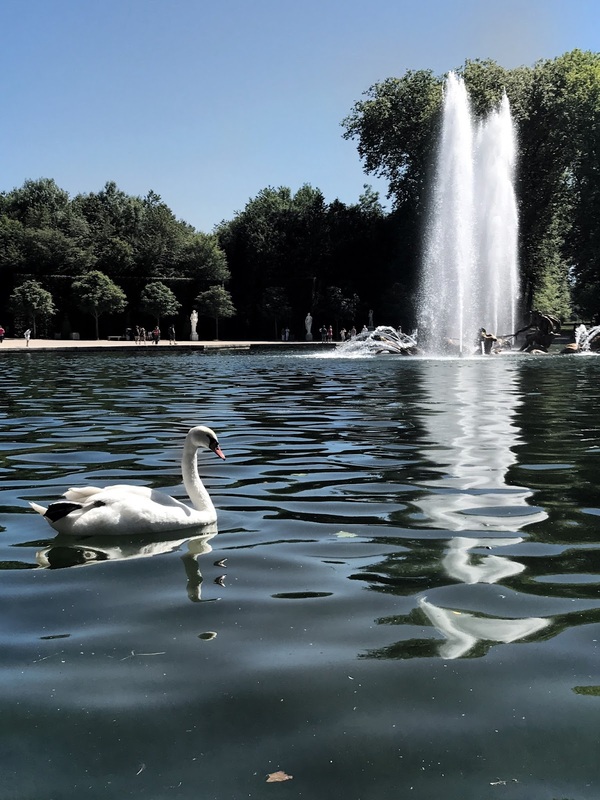 Versailles is a charming place! And you look so chic in those linen culottes (looks like linen :D). They must be a really comfy choice for hot and busy summer days. i love your outfit and the view. You look absolutely fabulous! I love Versailles, every corner is breathtaking! You look super stylish and I especially like the white blouse! The photos are very beautiful! This outfit is the definition of chic! And such a beautiful location as well <3 I love the neck scarf as well - such a cute addition! Oh my goodness.. this really is the most beautiful place! Love the series of shots from your day, your chic outfit suits the location perfectly! 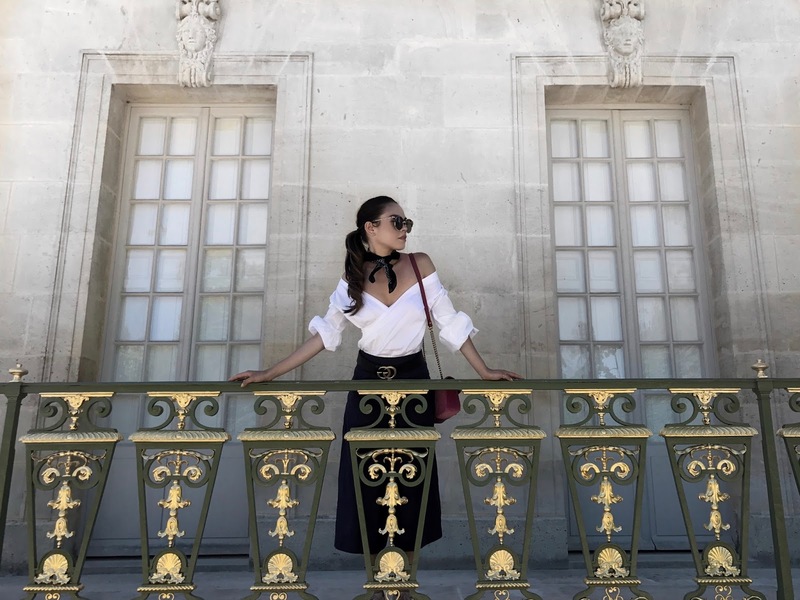 You look so chic at the chicest of all the french locations! Absolutely love it! que maravilla de fotos, me encantan! You look truly super chic. Trés trés chic! J'adore!! wow amazing pictures and great look! Crushing over this look. Love those shades. You look Gorgeous! You look so elegant babe! Couldn't agree more with all the styling tips either. Length of the dress/skirt is so central as well as a neutral color palette. Perhaps not the most exciting and unexpected fashion, but then again, they are some of the most well dressed women in the world! This is such a chic look. I love your culottes and bag. Love your amazing outfit especially your adorable culottes, seems comfy to wear. Thank you for sharing, you look gorgeous!!! You and your hubby totally nailed these photos! I die! I wouldn't change a thing! Your style is on point, girl! Love your outfit and love this blog post. I think the shirt ties everything together really nicely and keeps the outfit looking summery and light! You look very pretty! I love the bag too! Oh my goodness! !This is chic.So fancy but so comfortable from the looks of things.You look so beautiful.I love the location of the pictures as well. Stunning photos. I love the GG statement ! Loved this Parisian tips! Your bag is adorable! These photos and outfit are gorgeous Rina! I am so glad you enjoyed your European trip! oh wow these photos are beautiful! Gorgeous top! Actually, I love your whole outfit!! What a gorgeous location and really gorgeous chic outfit! This look is so unique and so lovely! Your photographs are truly breathtaking.